The Macintyre pottery factory at Burslem went through a period of expansion from 1893 to the turn of the century, developing not only their utilitarian wares but also creating an Art Pottery range. 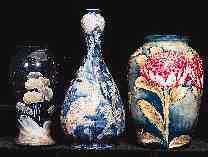 This followed the Arts and Crafts tradition, and competed with contemporary art potters such as Doulton. Macintyre's quest for a designer to run this decorative side of production ended in 1897 with the employment of William Moorcroft. Following on from Harry Bernard's Gesso Faience range, Moorcroft developed new shapes and patterns for both printed and enamelled ware. His designs shortly carried the new 'Florian Ware' backstamp with his signature, although some transitional pieces are to be found with the anomaly of the older 'Gesso Faience' mark and Moorcroft's signature. 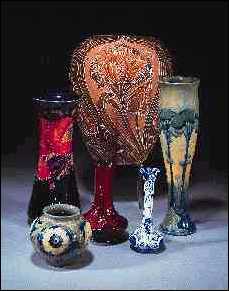 Selection of vases sold in 1995. Back: large Florian ware vase with tulip design, £2,475. Landscape pattern vase, made for Liberty & Co, £3,150. Moorcroft's association with the Macintyre factory ended in June 1912 but by May 1913 he had already purchased land in Cobridge which would become the Moorcroft factory. William Moorcroft's interest in botanical studies and organic form led to experiments linking design with decoration, an aspect which is appreciated by Moorcroft collectors today. Although items can be valued by size and pattern, it is the complexities of linking the painted design to the potted shape that ultimately determines value. The Florian Ware range, based around designs of British wild flowers like narcissi and cornflowers, also included designs with butterflies and fish. The vase shown below, for example, is painted with three diving and swimming carp between tall columns of gently swaying waterweed. Moorcroft also experimented with landscape designs which are now highly sought after by collectors ­ evocative Moonlit Blue and Hazledene are always popular. The slender vase (above, far right), made for Liberty & Co, is painted with a landscape pattern which undulates with the surface of the vase. It sold for £3,150 in 1995. A rare example of a landscape on a black ground was offered by Christie's South Kensington. Simply termed Black Landscape by collectors, this design is known from very few examples. The baluster vase, only 22cm high, is painted with a frieze of ghostly trees on waves of rolling hills in shades of celadon and white slip, the black sky is inhabited by flocks of birds. Tantalizingly estimated at £2,000­3,000, vases of this calibre have fetched up to £7,000 at auction with collectors vying for these emotive designs. Moorcroft's experimental designs which came to fruition around 1910 include the Claremont pattern of toadstools painted in shades of reds and yellows on a green ground. Again the design was worked to fit the shape of the vases. Examples can be found with large and small toadstools arranged in bands or clumps, while some vases are individually decorated with several bands of fungi. Ovoid vase made for Liberty, £1,100. Moorcroft continued to produce floral designs into the 1930's using more and more exotic flowers. Waratah, a design based on an Australian flower (circa 1932) has particular appeal to Australian collectors. 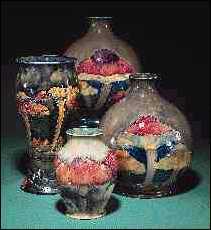 In 1993 a globular vase only 11cm. high, covered in a flambe glaze, sold for £2,200. Introduced in 1910 and produced up to circa 1938, the Pomegranate pattern is one of the most prolific and collectable patterns, being decorated on a large quantity of domestic and decorative wares. Although quite common, the pattern is still highly collectable with well painted examples fetching four figure prices. Model of a bear, on hind legs, covered in a flambé and yellow glaze, 16cm. £1,000-1,500. An anomaly in Moorcroft's designs is a series of animal and bird models designed by Francis Arthur Edwards circa 1925. These animals were glazed at the Moorcroft factory with experimental colours and applied with a Moorcroft paper label. Walter Moorcroft joined the company in 1935, taking over when his father collapsed with a stroke in 1945. He continued to produce floral designs. Their later production and thus greater availability means they are often more affordable and provide a good start for new collectors. The company is still thriving today producing quality decorative ware in limited editions, with particular designs being produced for the thriving collectors club. 1996 saw the factory turn almost full circle with their William Morris Centenary collection designs paying homage to one of the designers who inspired Walter Moorcroft one hundred years ago.